Chapter 6 of the book is about Categories and Sectors. No prizes for guessing which is his favourite, but we’ll go through all six. Market leaders have made Mark most of his money. They are often gaining market share and growing their earnings. They often have superior products in a growing industry. These stocks are easy to identify, but many investors find them difficult to buy. They are often highly rated, and their shares will be the first to rise in a bull market. Institutions on the other hand are only concerned with prospects, and will drive the price higher. After that it’s down to execution. Mark uses Cisco and Walmart as examples. The entry price is the key problem. Fast-growing companies will obviously be valued more highly than slow growing ones. But with the fastest growers, the market and the analysts can’t keep up, and they will still be too cheap. 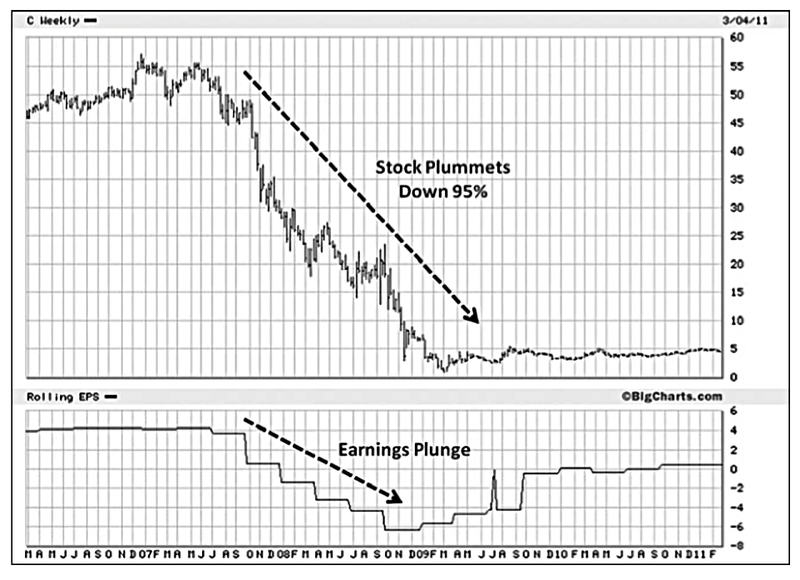 But of course, if earnings slow, the stock price will fall. Mark particularly likes “category killers” that are almost impossible to compete with. Unfortunately his first example is eBay, which I would say has now lost its battle with Amazon. Apple, Disney and Walmart – his other examples – are more like it. He also likes “Cookie Cutter” companies, which we might call roll-outs. He has a long list of these, a minority of which have now made it across the Atlantic – McDonald’s, Starbucks and Gap are the only ones from his list that we have over here. European culture is less monolithic than the States, so roll outs don’t work as well over here. Ikea might be a good example if it wasn’t privately held. You can make money with retail (particularly restaurant) formats in the UK, but it won’t be as much as in the US. Mark recommends looking at like for like sales to identify rollouts that are growing quickly. 10% to 25% pa growth is best. He also prefers wholly-owned rollouts to franchise operations, and he looks for diverse regional success. This latter point is more applicable to the US, but in the UK there is a distinct split between what works in London (and some university towns) and what is good for the rest of the country. The number of new openings per year should also be manageble. He cites Starbuck as an example of a firm that expanded too fast. Mark points out that usually only two or three companies in a sector are really successful. Coke and Pepsi are the obvious example. Coffee in the UK is an interesting exception – we have Costa, Starbucks, Caffe Nero and Pret, all of which might be considered successful. We also have four main supermarkets, not to mention the two German discounters. But increasingly new products and sectors involve tech, and that tends to increase the chances of a winner-takes-all scenario. Apple, Google, Facebook, Microsoft, Amazon and Netflix are all leaders in their niche. Mark says that the number two company can be worth following, and that it will sometimes take over as number one. He notes that Yahoo took over from AOL, and was later defeated by Google. An even better example is Netflix wiping out Blockbuster. 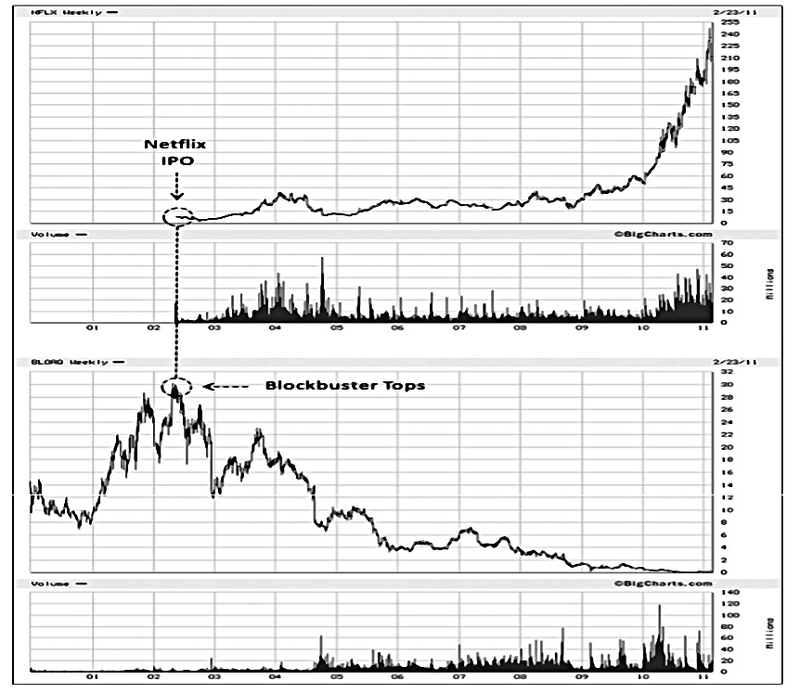 By October 2009, Netflix was trading at 32 x earnings, while Blockbuster had a PE of 2. But Netflix was still the better investment. These are also known as quality companies, blue-chips or stalwarts. They are mature, with a track record of consistent sales and dividend growth. Earnings growth should be above 10% pa.
UK examples might be the drugs firms (Glaxo and AstraZeneca), the consumer firms (Unilever and Reckitt) and possibily the oil firms (Shell and BP) before the oil price crash. They are popular with institutions and often with dividend investors. But they are big and sluggish, and too widely followed for rapid price appreciation. So they aren’t of much interest to Mark, except as turnaround situations. Mark likes turnarounds, but he likes to see two or three quarters of strong results before investing. 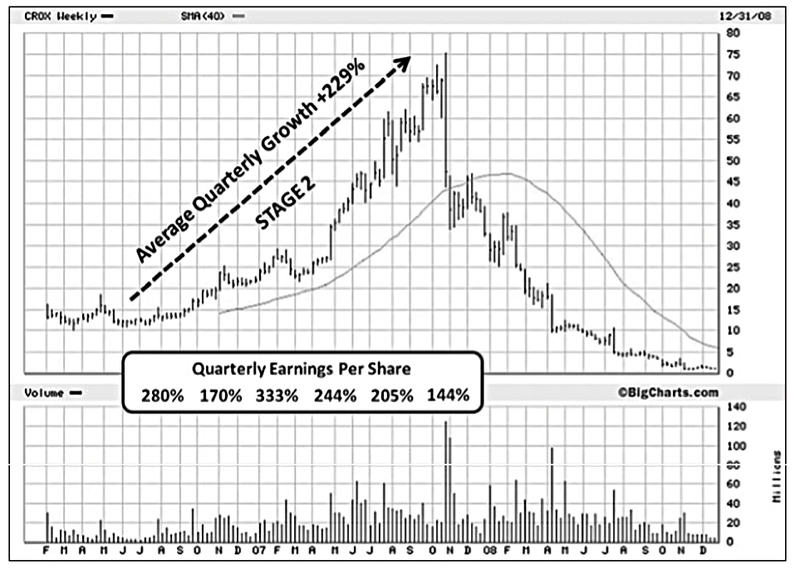 He wants the TTM (trailing twelve months) earnings to be near the old peak. He also wants evidence that margins are recovering, and the good results don’t depend only on cost-cutting and improved productivity. He also looks at the cash burn and debt levels to make sure that the company won’t go bust. 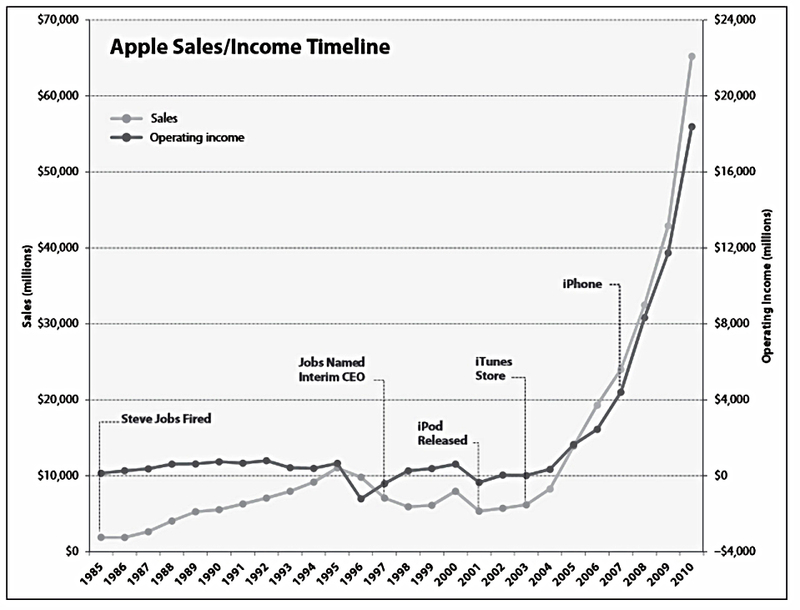 He cites Apple as a good turnaround stock back in 2003. Since most UK companies only report twice a year, turnarounds can be tricky over here. One good set of results could be a fluke, and two might mean that everybody has noticed the recovery. Cyclicals are sensitive to the economy (the business cycle) or to commodity prices. They include car firms, steel companies, paper stocks, and chemical firms. Consumer discretionary (as opposed to consumer basics / staples / defensives) are also cyclical. These would include airlines and travel firms, furniture and clothing, hotels and restaurants, leisure and entertainment, and white goods firms. As illustrated by the quote from Peter Lynch, they have an inverse P/E cycle. They have a high PE ratio when they are about to go up in price, and a low PE when they are about to drop. The key with cyclicals is to work out whether the next turn will arrive early or late. Dividends may be cut or missed. The P/E ratio is low. Laggards are the opposites of Market Leaders. They generally have worse earnings and sales growth, and a worse stock price performance. They make catch up a bit at the end of a cycle or when a sector is hot. They appear cheap compared to leaders, but you mustn’t be tempted. Usually the leader is really the cheap stock. Mark notes that new bull markets are lead by a few sectors, and that you should concentrate on the leaders in these early sectors. Once again, this is very similar to Weinstein’s Stage Strategy. Mark uses the new 52-week highs list to identify the leading sectors. He focuses on stocks (bottom up) rather than the sectors. 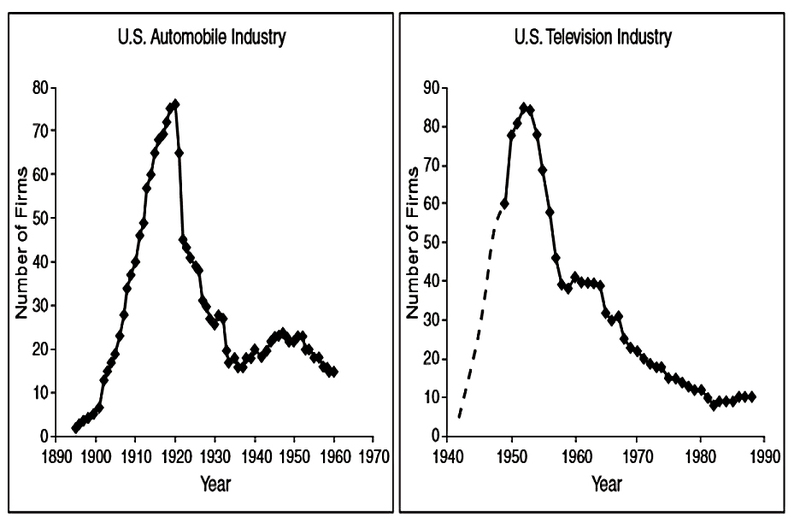 Leisure / entertainment (which is increasingly tech-driven). Mark looks for new niches, proprietary technology and deregulation. You need things that will help people work better, live longer, and enjoy life more. Or that help companies cut costs and improve productivity or efficiency. 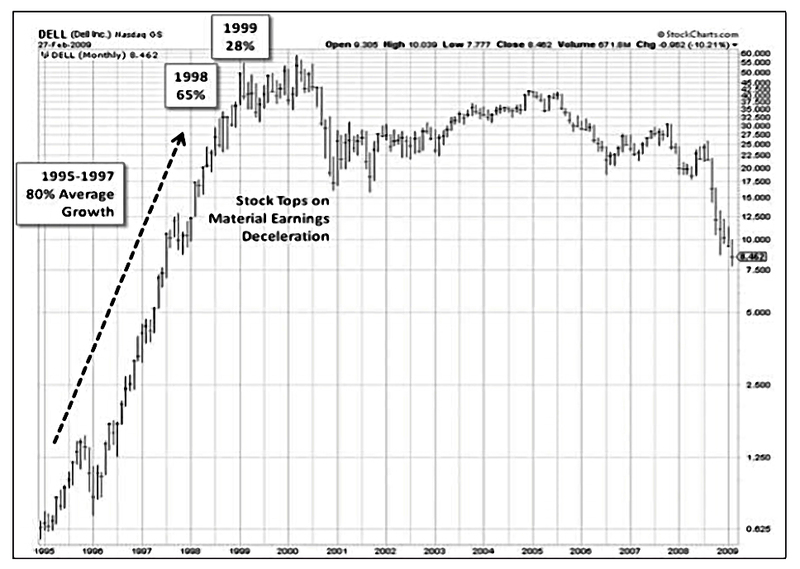 Mark points out that when leading stocks in a sector hit a bump, the whole sector can be in for trouble. But since he is focused on and mostly invested in the leaders anyway, he will be quickly aware, and won’t suffer much collateral damage. 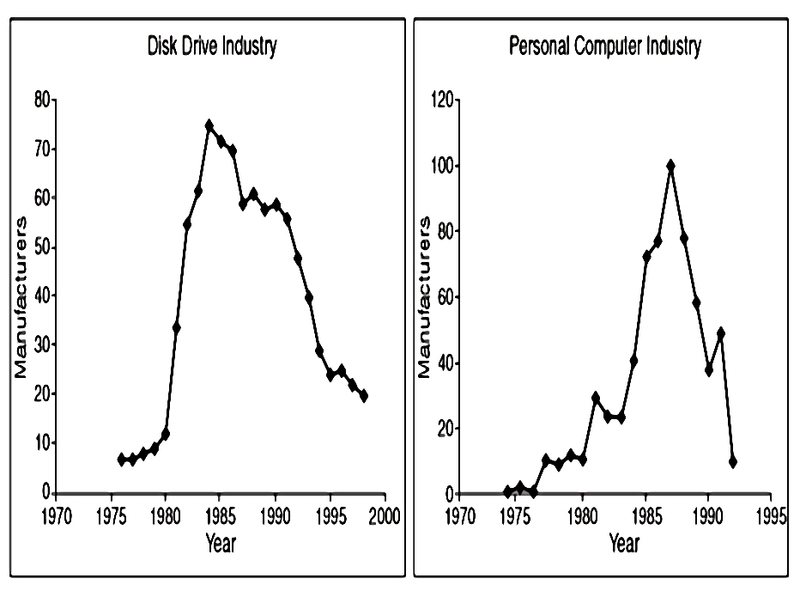 Mark has some nice charts showing how new tech eventually becomes old. Things start out expensive, but eventually fall in price and saturate the market. As technology moves on, these cycles become more rapid. Chapter 7 of the book is about fundamentals, and for Mark this chiefly means earnings. The market doesn’t care about the past, including a company’s reputation. It cares about the future, and growth (in earnings and sales). So don’t get sucked into a well-known name that’s having bad times. In real estate, the mantra goes “location, location, location.” In the stock market, it’s earnings, earnings, earnings; it’s the bottom line that counts. There are three basic questions every investor should ask when it comes to earnings: How much? How long? and How certain? Profitability, sustainability, and visibility are the most influential factors on stock prices. 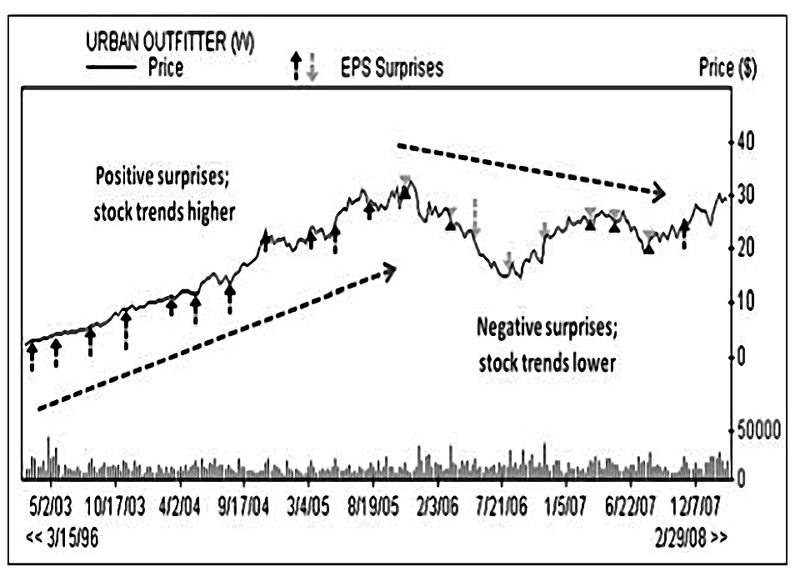 What we are really looking for is (positive) earnings surprises. This means that actual earnings are higher than consensus analyst estimates. Changes in regulation and things like successful drugs trials can have similar effects. Mark talks about anticipation and surprise, and how often the best plan is to Buy The Rumour and Sell The News. This means that buying on the day of a positive surprise may not be the best plan, as there could be sellers who bought much earlier. It could also go the other way, with a flurry of buyers. But if you think the news represents a new phase in earnings, then you should buy within the folowing few days. Studies have shown that the effects of the surprise can last for months. Mark calls the fact that one surprise means that more are coming – for the same firm, or others in the sector – the Cockroach Effect. This works with bad news also, hence the phrase “Bad News Comes in Threes”. The bigger the surprise, the better. In the US in particular, companies leak estimates that they know they are likely to beat. So a small “surprise” might not mean much. After the surprise, look for analysts to raise their full year earnings estimates by at least 5%. Upwards revisions before the results are also good things to look for. Earnings surprises will draw in more investors – including institutional investors looking for growth stocks – and create a momentum situation which is self-reinforcing. Expectations increase until the firm disappoints and the cycle reverses. Notice once more how this chart matches the Weinstein Strategy. As discussed in previous articles, you want to be on board for Stage 2 and jump ship during Stage 3. 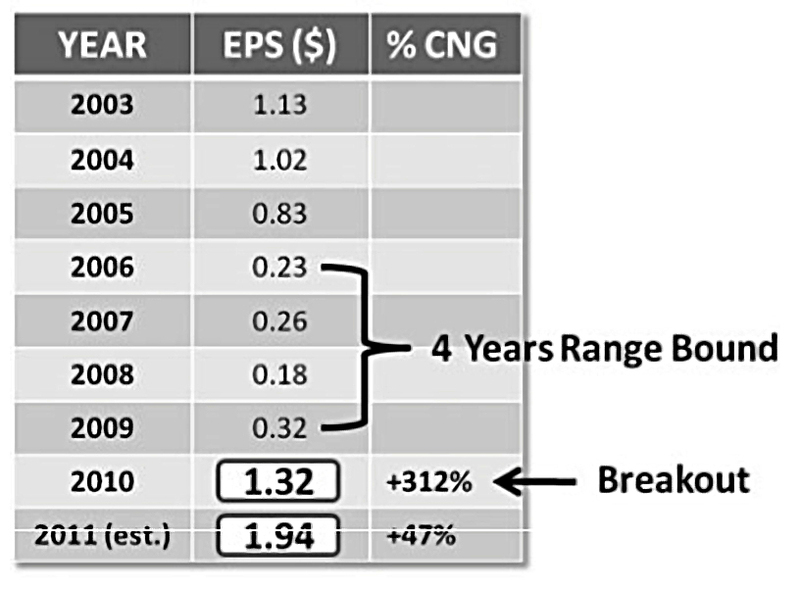 Earnings is the number best correlated with the stock price increase. Look for increasing earnings now, not projected earnings increases in the future. To ensure that your stock is attractive to institutional investors, demand that a minimum level of current quarterly earnings performance be met before investing. Many successful growth managers require a minimum of 20 to 25 percent year-over-year increases in the most recent one, two, or three quarters. The greater the percentage increases, the better. Really successful companies generally report earnings increases of 30 to 40 percent or more during their super performance phase. In a bull market you can set your minimum even higher; look to find companies delivering increases in earnings of 40 to 100 percent or more in the most recent two to three quarters. Mark recommends keeping a diary of reporting dates of the stocks you are interested in. Mark uses Elan (a company I’m not familiar with) as an example. 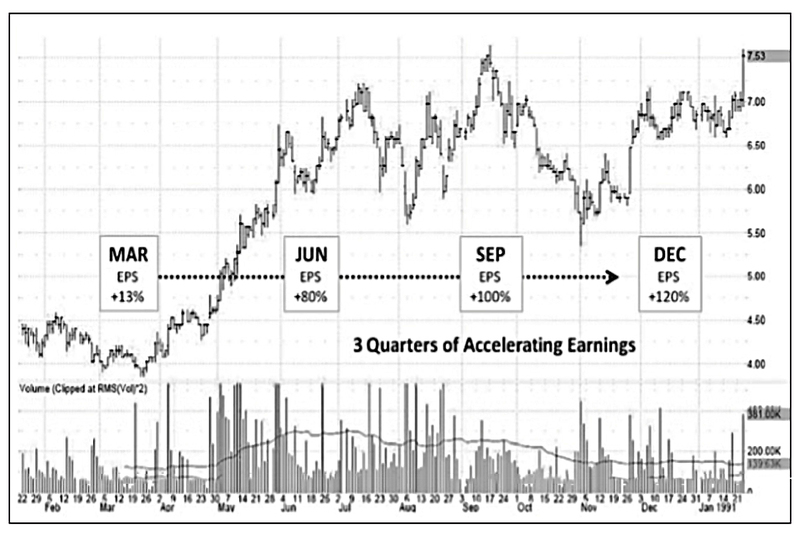 Accelerating earnings per share (EPS) is a very good sign. 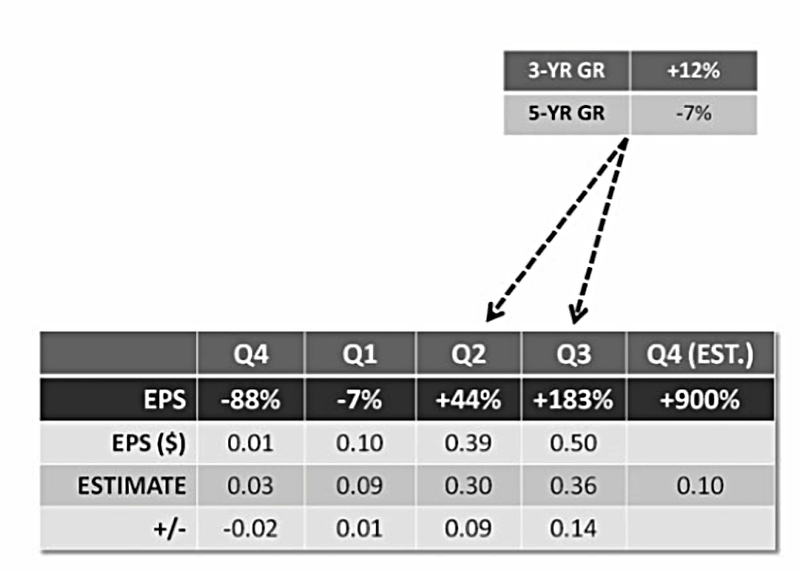 Mark looks for sales to show the same characteristics as earnings: strong quarterly growth and acceleration. Netflix is a good example here. Sometimes Mark likes to look at longer-term trends in earnings and sales, and will use a two-quarter rolling average over the past four, six, or eight quarters. This can be taken further, to look at annual earnings. This approach would be more common in the UK, where there are fewer earnings announcements. These longer trends can also be used to spot turnarounds. With turnaround situations, investors should insist that the current earnings be very strong (+100% or better in the most recent one or two quarters). A company that has been growing 12 percent a year and suddenly starts to show growth of 40 percent and then 100 percent could be a hot prospect. Mark’s classification of companies and focus on market leaders was very interesting. The chapter on fundamentals was less satisfying, since it boiled down to earnings and sales growth and surprises. I’ll be back in a few weeks with the next two chapters, which are on earnings quality and leaders (again).